So, there we were … at the store, looking for stuff in which to grow bacteria. Seems like it’s a short equipment list for the yogurt people. This is a good thing, since our idea’s motivation is to save money, and fart around while we’re at it. All we bought there at the (dare I say it) Target store was a digital thermometer. Seems yogurt is all about temperature. Get that right, and you’re golden. So it says in countless internet blog snippets. 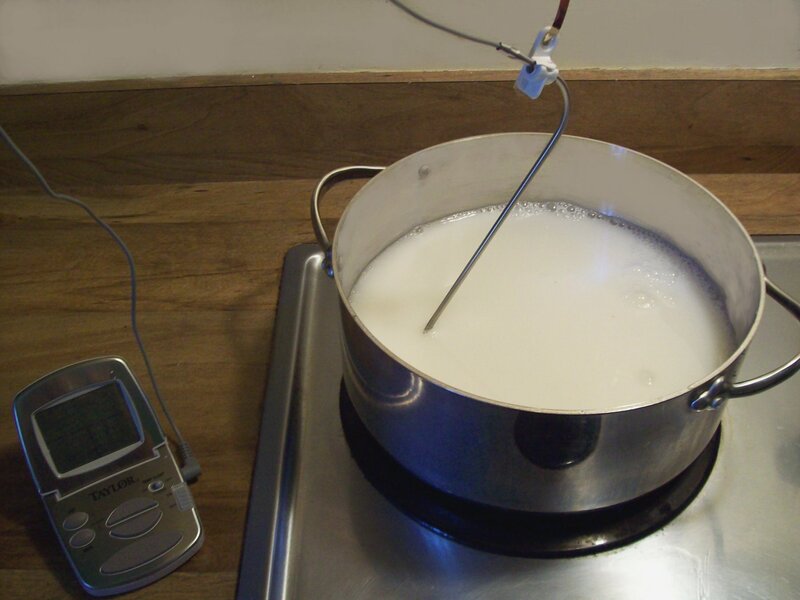 Oh – and don’t blow the sterilization – or you may end up growing some a*n*t*h*r*a*x, and that likely would not be so good for our digestive systems as would be the yogurt! 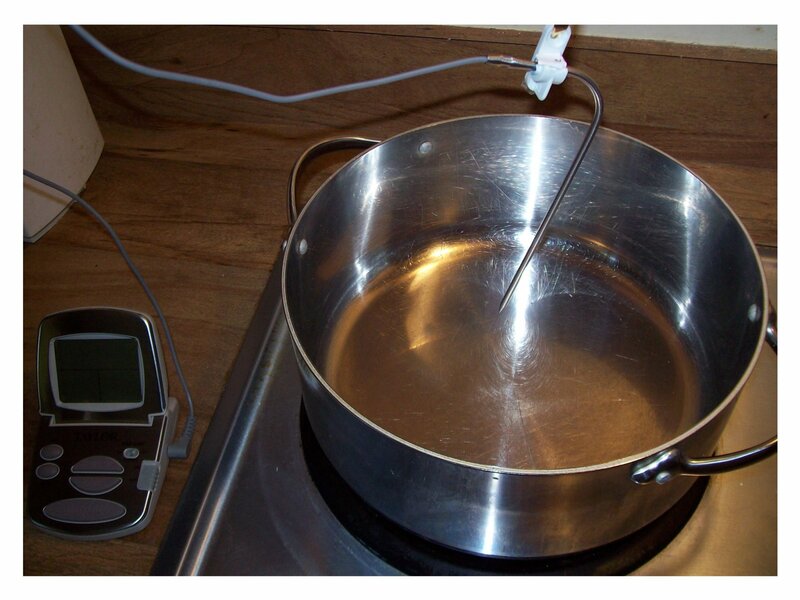 At home, I tossed everything that I thought I’d touch during the process into my sterilizer. Yes, I know it looks a bit odd for a sterilizer. It’s not quite as fancy as the store bought job. I suggest that you find a fancy one with dials and racks so that you don’t scald yourself to death. My version seems to work OK if I submerse everything completely in the boiling water. Or so I am apt to think. This is being written after making one round of yogurt, eating it, and surviving. However; you’d be taking your chances following my advice. 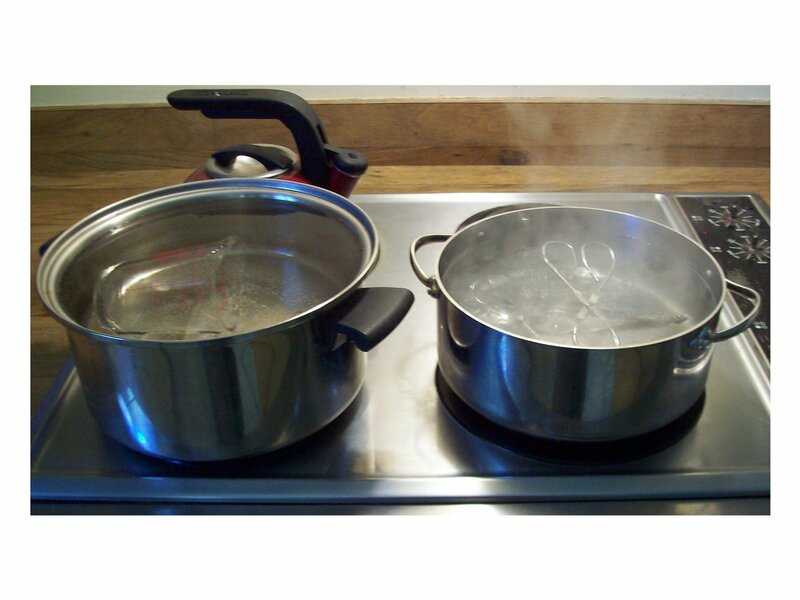 Figure 1.2 - Sterilize everything in sight! I bought some two percent fat milk. 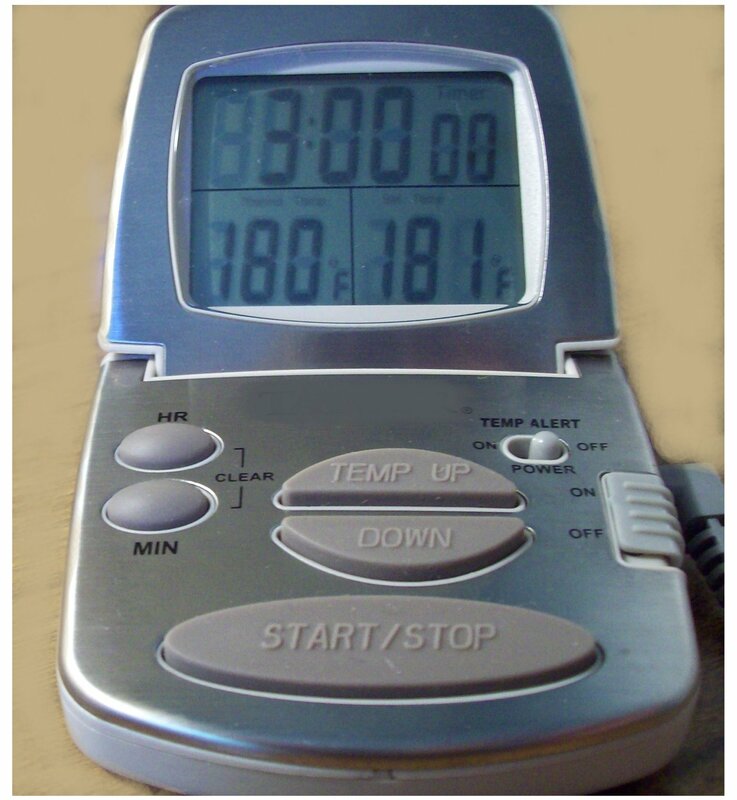 I heated it to 180 degrees (see the thermometer reading in the figure). Some people say go up to 185. Maybe that’s safer. I think some guy named Louy called this part of the process pasteurization. Go figure. Methink’s the idea is not to trust the milk manufacturer, who (it says on the label) already did this. If there were any *a*n*t*h*r*a*x* left in the carton, well … you know … we’d all end up with hairy knuckles. See my fancy thermometer sensor hanger. I used fireproof ribbon and a curtain hanger clip. You might want to try something with more design documents, cost, specifications, and somewhat less wife “Oh yuck” statements accompanying. Mine worked for trial number one. 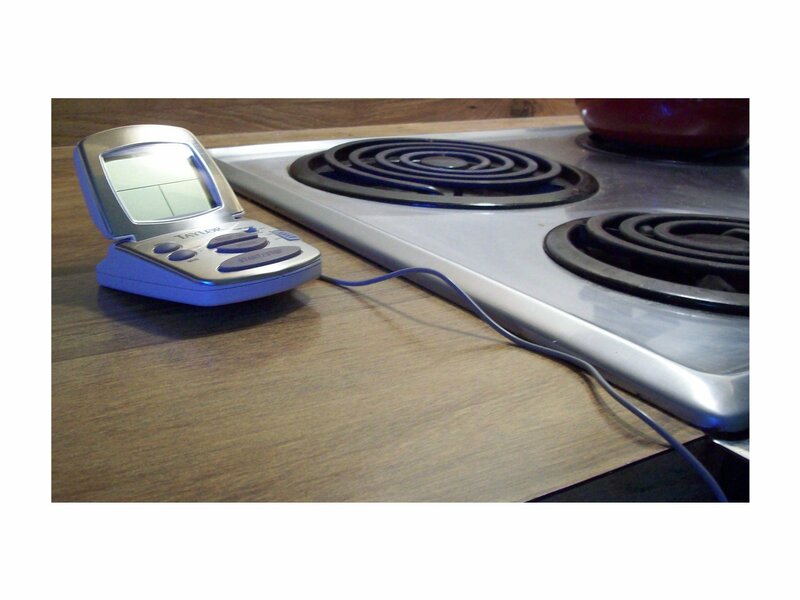 Make sure the tip of the thermometer doesn’t touch the bottom of the pan and give a false high reading! meant to tell you to do that. 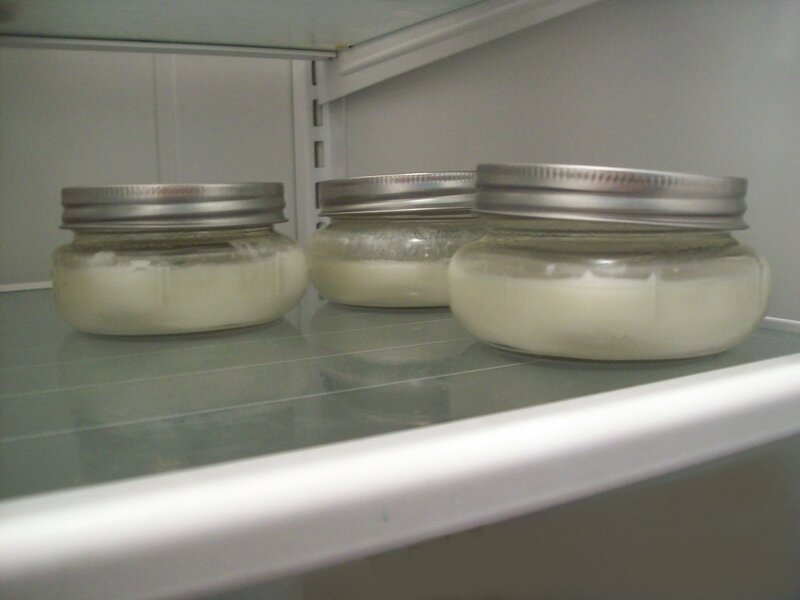 Pour the 115 degree milk into a few glass jars (sterilized). Put these in the 100 degree oven, and wait seven hours. Yeah – it’s a long time. Sorry. Seems to be no way out of that part of the recipe. I suggest “Ladies home and Garden” for reading. Kidding. If you have very active, high density starter culture, the time may be less. Frequent checking is advised (every thirty minutes after about three hours) until you have determined what your chosen starter is likely to do. In my case, I checked the yogurt after seven hours. It was much like custard. Then I refrigerated it. If you use two percent milk as I did, the yogurt will be somewhat soft. Whole milk makes it firmer, and cream the firmest. Mileage may vary. Some sites on the internet have information that so-called “Greek” yogurt uses the cream. Other sources say that the firmness can be increased by holding the 185 degree heat for thirty minutes. Apparently, the protein breaks down and allows a more gelatinous mass to form. Again, I’m not the biochemist here. Enjoy! 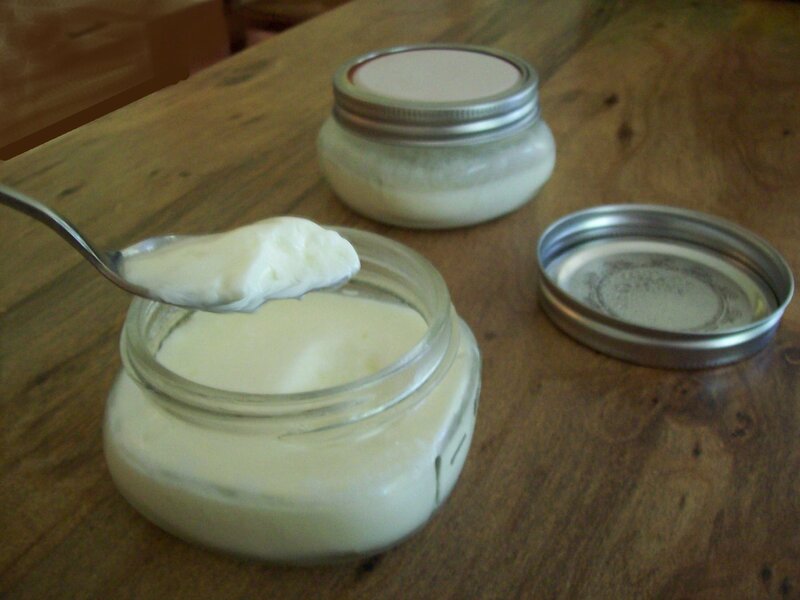 Fig 1.0 – Finished jars of yogurt – trial number one success!